You are here: Home / Mental Game of Soccer Role / Mental Game of Soccer Tips for Players / Do You Perform Better in Practice Than in Games? 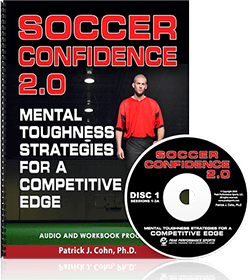 The number one reason a soccer player or coach contacts a mental game coach for soccer is because a player performs better in practice than in competition. This is a telltale sign that you or your athlete is struggling with their mental game. What does it look like when you can’t take your practice game to competition? Do you play freely and relaxed in practice, but choke up in competition? Does your performance feel tight, controlled, or lack freedom when you compete? Does the pressure of big games cause you to tense up and lose trust in your skills? 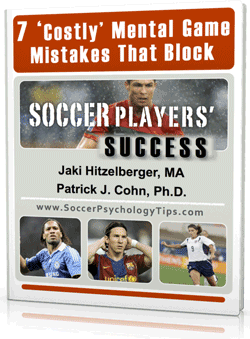 Many hard-working and determined soccer athletes lose confidence when it comes time to compete. There are many reason soccer players perform better in practice than in games. You focus on the strengths of your competitors rather than your own strengths. You think about technique while you play and over analyze your passes and shots. Fear of failure causes you to become anxious and tighten up. You try to avoid making mistakes by “playing safe” or more defensive. You expect perfection and get hung up after a few bad passes. All of these mental game barriers lead to under-performance when it counts the most. You then become frustrated because you know you SHOULD play better, the way you did yesterday in practice! If your mind is getting in the way during competition, what’s the solution? The first step is to understand how you are sabotaging your game in competition. Are you being held back by fear of failure? Do you worry what your coaches, parents, or teammates will think if you mess up? Are you trying to play perfect soccer? Once you understand how you’re getting in your own way, you can address it and make changes. Many soccer players we work with continue “training” when they compete. They bring their “practice mindset” to competition. They worry more about how it looks and feels rather than just getting the job done. If this rings true for you, the key is to learn to separate your practice from your game-time attitude. But even more important, you have to commit to playing ugly soccer, letting go of technique, and to getting the job done when you compete. When you arrive to the soccer field, it’s time to have faith in your team, trust your training, and believe in your skills. 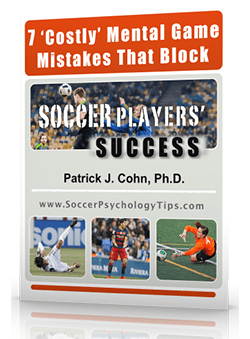 We provided only a few examples of how your mental game can get in your own way, take our free mental game assessment for soccer to determine other mental game barriers to peak performance in competition.